Creating your own personal blog is a great way to establish your authority in a niche and create your own personal brand. Blogging under your own name around a subject connected to your business can help extend your personal reach and in turn help build your business further. Maybe you ask yourself, is it a good time to start a blog? Do I really need it? Can it help me in my business? Maybe it sounds harsh, but yesterday was a good time for you to have a personal blog. Why? Having blog is essential for your business. Not that it presents you as an expert in the field, but it also tremendously helps you to rank in the search engines and open new business possibilities. Blogging under your own name will make you stand out in the crowd and bring you new opportunities for you to grow. To create the correct look for your personal brand, your choice of theme is essential – the theme needs to look smart and modern and be accessible on all devices, it also needs to incorporate the tools you need to connect with your audience. This means your need to be able to encourage visitors to signup to your email list, let them add you on social networking sites and they should be able to read your latest posts and also the best of your older content. 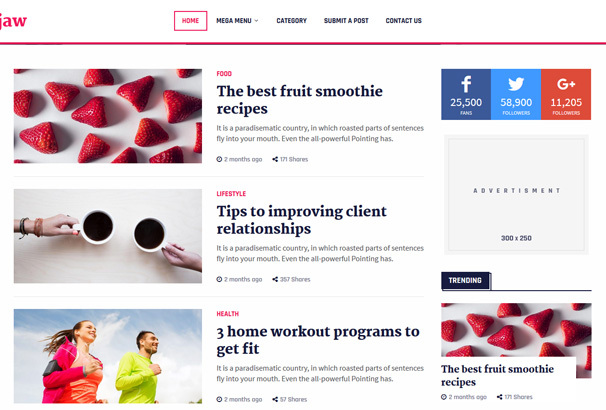 In this collection we have gathered together a number of excellent personal blog WordPress themes which have the features mentioned,these themes are ideal for SEOs, Digital Marketers, Authority Figures, Thought Leaders, Business Bloggers, Personal Bloggers, Solo Entrepreneurs and More. Choose your theme from the list below, pick a WordPress Web Host and start building your personal brand with WordPress. Divi theme stands for one of the most versatile themes available. With its modern design and a broad range of features, It’s flagship theme from Elegant Themes. With more than 87 available themes it attracted a lot of attention. It’s regularly updated, have impressive page builder tool which you will like since it doesn’t require any coding knowledge. This page builder is unique true front-end website creation tool with module and point and click approach with a possibility for you to create custom designs tailored to your brand and business. With Divi, you can customize and style your website in almost every way. It offers lots of page templates and layouts, well-covered documentation and customer support. 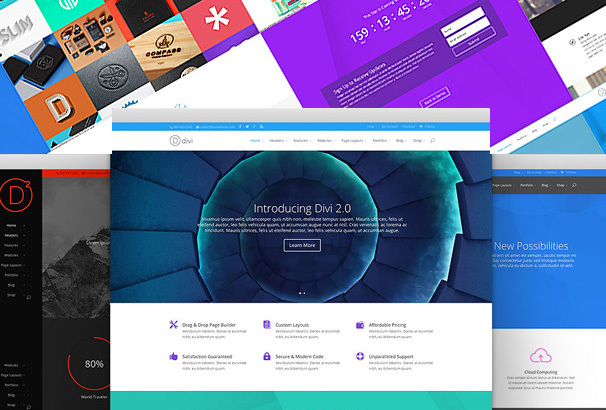 If you’re looking for a modern, responsive, well-rounded, user-friendly theme, then Divi is the right theme for you. 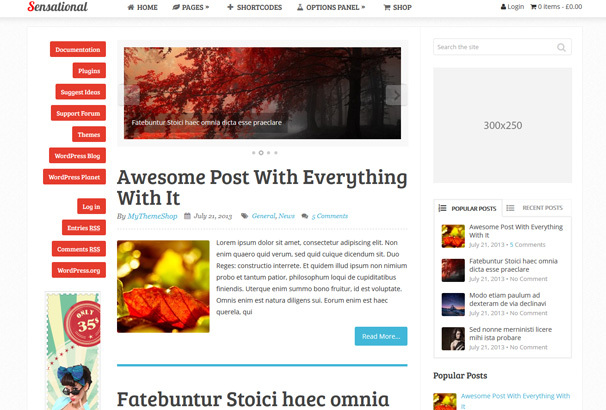 If you are looking for the modern theme with traditional blog layout, then this theme will surely be your best choice. 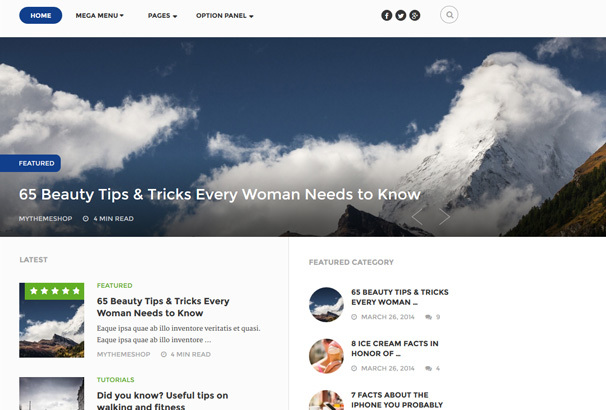 It’s modern theme designed and developed with bloggers, writers, and photographers in mind. This theme comes with two custom widgets: author box, and about me info area with social media profiles. 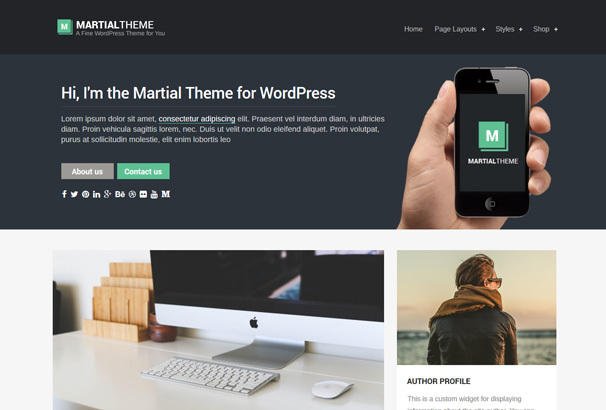 Also, Martial has WooCommerce support, so you can use this theme to sell your goods and services online. As with all modern themes, it’s fully responsive and will look good on all mobile devices. If you are content creator it’s highly recommended. Website loading time is one of the most important factors when it comes to SEO, and with this theme, you can safely keep adding your content while theme speed oriented architecture will quickly rank you high in the search results. Authority theme is looking great on a desktop as well as on mobile, and in today’s world, mobile responsiveness is a must – no questions asked. With near unlimited color combinations this theme will perfectly fit in your brand colors, and give your site that unique look that you can only get from custom web designers. Authority theme, as the name suggests, will help you build your blog with trust and authority, and with full endorsement from Matthew Woodward, this theme will be a go-to theme for you. SocialMe is a perfect theme if you are into creating a lot of social media content. It’s a light and modern looking theme with lots of powerful features. It’s designed and developed to help you engage visitors and build large and strong community. 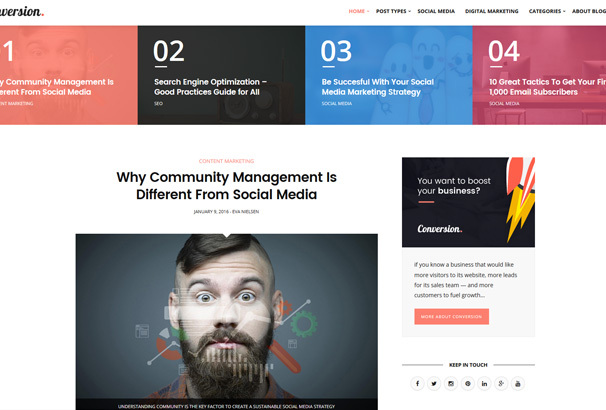 SocialMe is a professional blogging WordPress theme from MyThemeShop and offers 4 homepage layout options, Woocommerce support, author box, social media integration, off-canvas mobile menu, unlimited color options, parallax scrolling effects, and more. It’s ideal for viral content, multi-author, professional, food and lifestyle blogs. Cool is one of those themes that have the eye-catching design, and it’s perfect if you want to impress your visitors and establish your online business presence. It’s good for personal blog and offers a variety of customization options. It’s SEO friendly and optimized for speed and monetization with AdSense and with it’s 4 different layouts you can be assured that your site is unique and recognizable across the internet. Also, with multiple drag & drop section, author box support and WP Mega Menu you can quickly arrange your website structure and content just like you want. 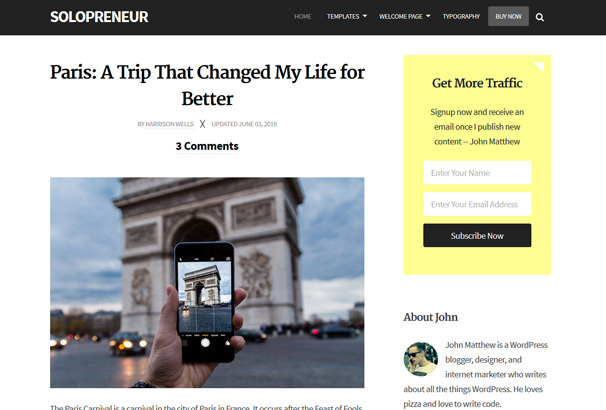 Entrepreneurship is a WordPress magazine theme that features multiple layouts and features like several page templates, social media integration, SEO code with an accent on page load speed and mega menu support. It’s optimized for better readability, have unlimited colors and sidebars as well as beautiful and effective design suited for your business. Entrepreneurship gives you everything you need to build a large blog with lots of content. Sensational theme is one of those themes that will turn your old website into modern looking one. It offers multiple layouts, beautiful sliders, unlimited color schemes and backgrounds. With advanced typography and integrated social media it will assure you that you have top-notch brand ready website. It’s worth to note that it has custom dashboard design that will optimize and streamline your blogging experience and thus making it a perfect fit for showcasing your content. 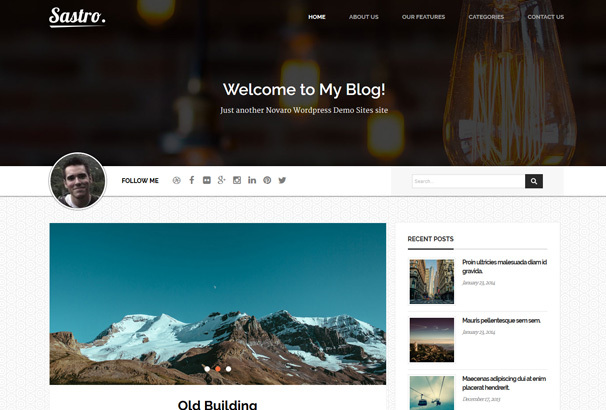 Solopreneur is a responsive blogging theme for bloggers and marketers. It comes with two custom landing pages and it’s focused on attracting, converting, and retaining loyal followers. Bring your brand to another level with custom designed logos, favicons, and social media icons. Also, you get two high-converting landing pages that highlight your latest products and footer call to action to increase your conversions. This theme is all about creativity. With style combined with usability this theme brings new possibilities of using grids. You will find easy to use grids to add various content types on single page. You will have your photos, narratives, images, and videos at one place. Minimalistic design is here to accent your photos and bring them in the center of attention rather than the design details of the site. 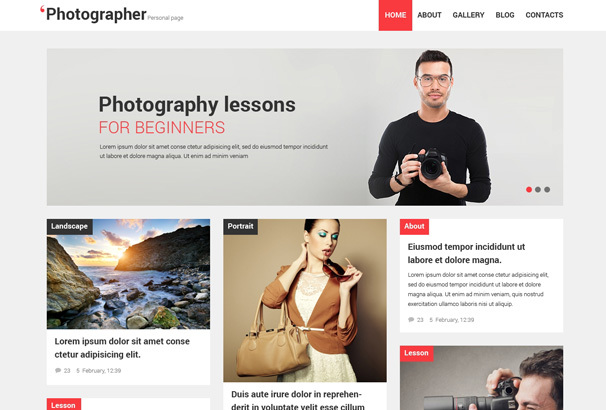 With this theme you will get your photos where they belong – in front of your visitors. 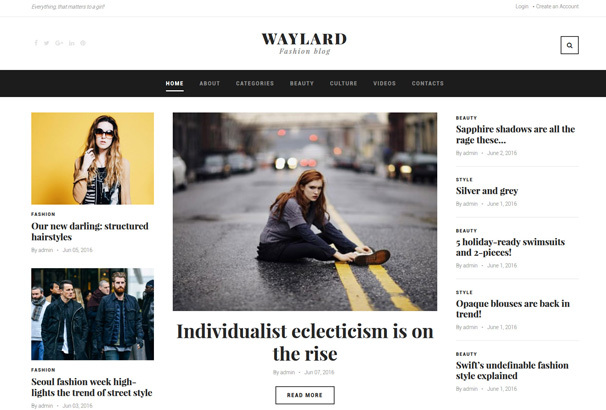 Waylard WordPress theme is a perfect fit for a modern fashion blog. It comes with full set of premium widgets which will be enough for you to build feature-rich websites. It comes with sidebar and social widgets and allows you to customize ads code. Besides that, installation is very simple and straightforward and gives you the same look like in demo mode. 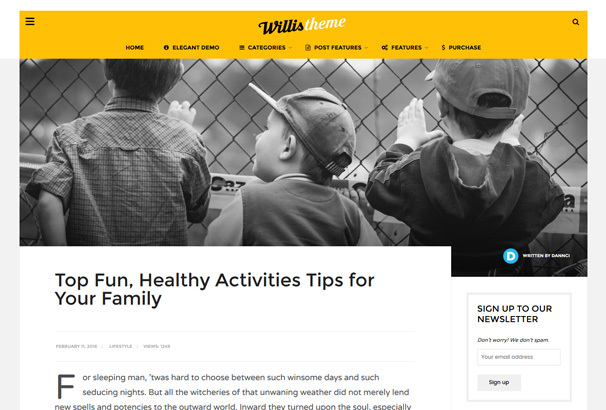 This theme’s content organization is clear and understandable and hollow call-to-action buttons look very good on black and white combination. 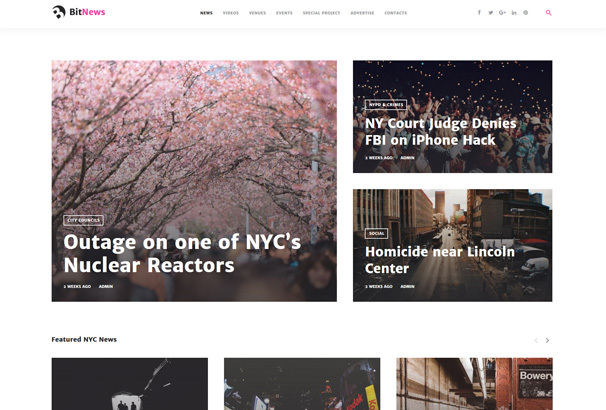 BitNews is a modern looking blog & news WordPress theme. If you are looking for a great theme that supports heavy content then this should be your first choice. It’s fully responsive, mobile ready theme built with valid, semantic code keeping latest web design trends in mind. Its intuitive card-based content allows users to intuitively and easily move through your website. BitNews utilizes white space very good, and with a pre-loaded set of Google web fonts, it offers multiple content hierarchies. It’s SEO friendly and best for those who are looking for out of the box solutions. 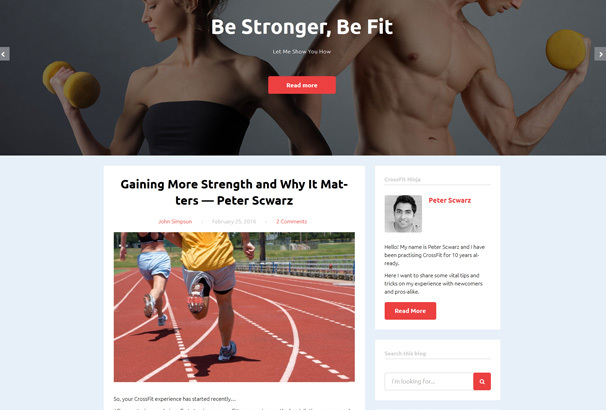 Fitnesys is a two-column fitness & gym blog WordPress theme. This layout structure allows you to organize content in the best possible way. The theme comes with a clean design aimed at well-balanced white space usage without compromising overall website readability. It’s mobile friendly and comes with complete social integration. If you looking for a clean and modern fitness theme then this is your best bet. 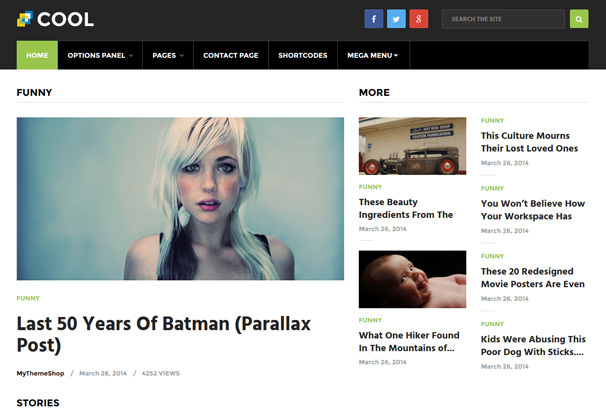 Extra theme is ultimate blogging and magazine WordPress theme. It’s worth to mention that it’s powered by the Divi builder so you can expect Divi theme functionality and content hierarchy behind it. It comes with a content builder, as well as post and page builder, fully responsive and ready for eCommerce. You can expect new extra category modules and layout for any situation. 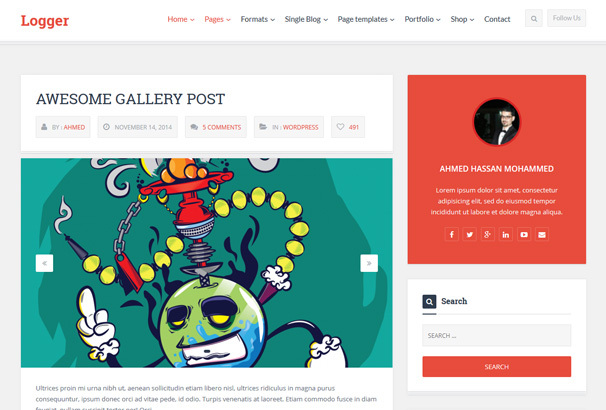 Its elegant design is tailored to be pixel perfect and good choice for your next awesome blog. Also, you can expect constant updates and bug fixes and compatibility with latest WordPress version. 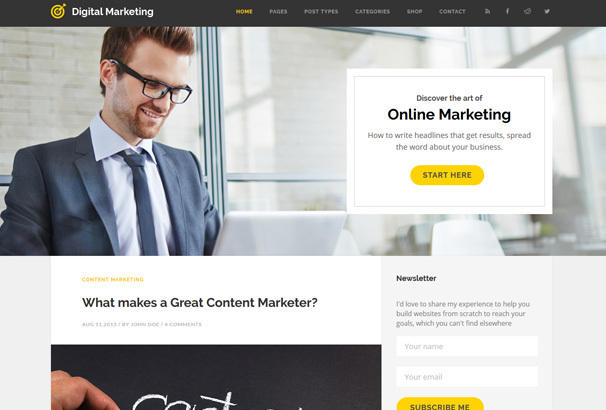 Digital marketing is marketing blog WordPress theme designed for marketers to increase conversion rates. It comes with social header icons, homepage with promote box, top subscribe widget and social share buttons below headings. It’s SEO optimized, fast loading and mobile friendly theme. Also, it comes with many useful features like unlimited color options, Woocommerce ready and 9 post type support which allows you to build your website in a few minutes. 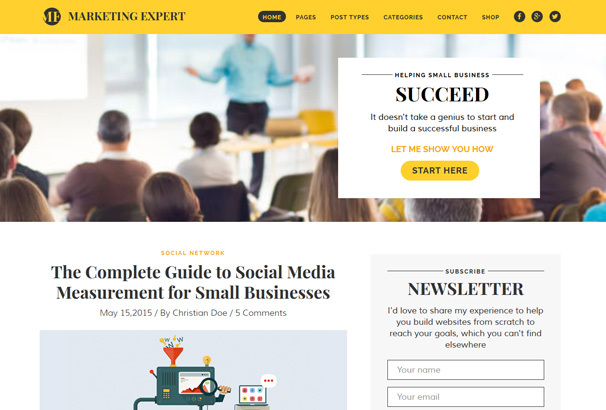 Expert is marketing blog WordPress theme truly aimed for marketers. Layout is build with increasing conversion rate in mind. It’s beautifully designed and looks very professional and clean. Besides that, it’s easy to read and understand and focuses on delivering content to visitors. As all high-quality themes it’s fast, readable, mobile ready, and SEO friendly. If you are marketer then this theme will surely catch your eye. BloMag WordPress Theme is also aimed at marketers. It utilizes Clean & Simple Design to increase conversions, and with Advance Bootstrap 3 Framework and cross-browser compatibility, it stays fast and SEO friendly. Also, it’s fully responsive and looks great on mobile. BloMag theme offers MailChimp synchronization and it’s SEO ready out of the box. 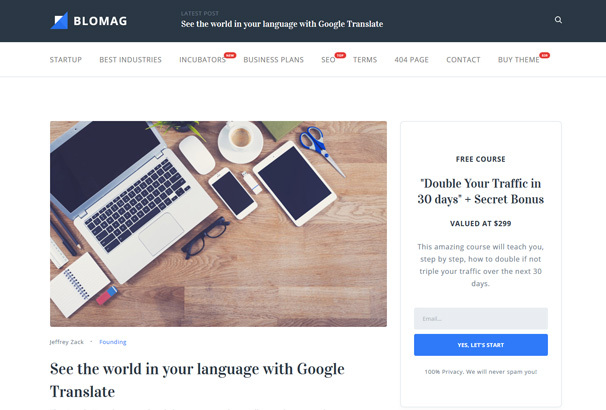 If you are marketer you will surely take in consideration this Adsense oriented magazine style theme. All files are well commented and you have exclusive access to extensive documentation. 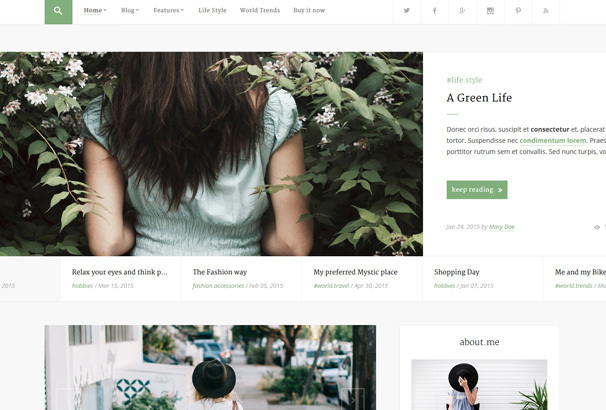 If you are looking for a clean and beautiful personal blog theme with responsive layout and elegant styling, then Blogist is the right choice for you. It offers content oriented theme admin panel so you can focus on creating great content. With clean homepage, responsive layout, smooth tabless design and unlimited color schemes designing a front page is a matter of minutes. You can also choose between 56 available fonts (web-safe fonts and Google webfonts) to further accent your content and bring it in front of the readers. Blogist theme is very easy to install and setup and it will be a perfect base for your online business or personal brand. It’s not Bruce Willis, and it won’t be your next superhero, but it will perfectly fit for personal blog websites. With performance as number one priority, this theme is simple and fresh blog theme with coded with passion and with elegant and modern, easy-to-use features it will be your next personal hero website. It comes with two main layouts, main slider, unlimited color schemes, Google webfonts, and custom widgets. Detailed documentation is a plus when it comes to customer support. 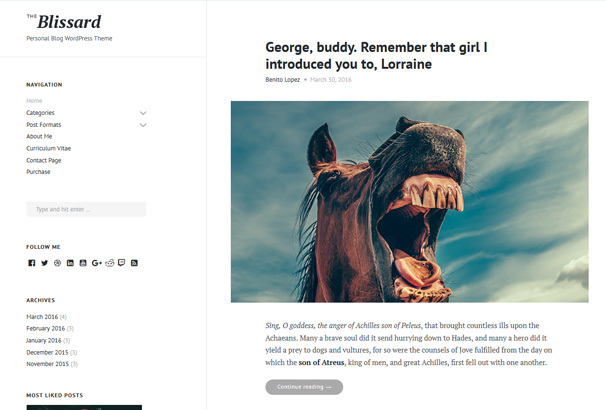 Blissard is an ideal theme for writers, bloggers, photographers, and other creative people. It’s easy to use and offers WordPress live customizer support to easily change site’s layout, and general look and feel. With the simple and easy approach, and quick installation you can start writing blog posts in few minutes. It has clean and commented code, mobile friendly and supports different browsers and devices. Documentation is well written and has video tutorials to help you out if you stumble upon problems. An overall good theme for content oriented users. 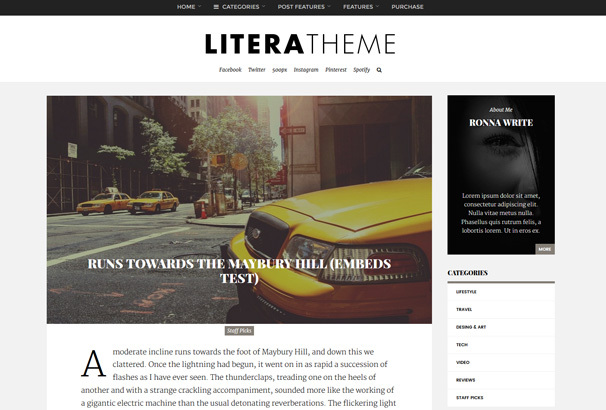 Litera is premium theme specially designed and developed for personal blog websites with performance and speed in mind. Don’t let classic like look trick you, because beneath modern and easy-to-use responsive layout is solid back-end Redux framework. It features main and small slider, unlimited color schemes, Google font selector, galleries, 5 post formats, and custom background images. The theme is based on SEO optimized markup, structured data markup, clean source code and very good site performance. 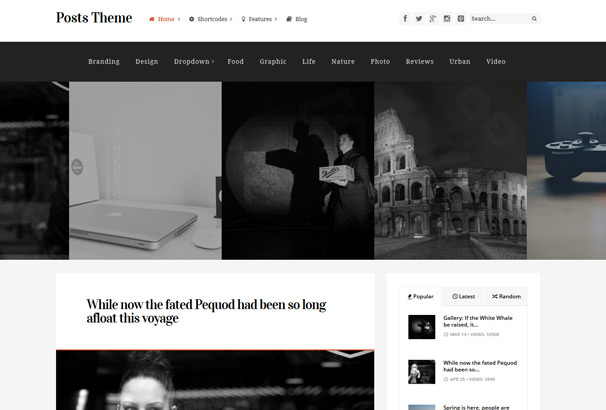 If you are dedicated blog writer this theme is highly recommended. Like its name suggests, Breeze is a theme that aims to make your blogging as effortless, simple and seamless as possible. It has great visual design and support for mobile and tablet devices. It comes packed with 14 custom widgets which are mostly social media oriented. 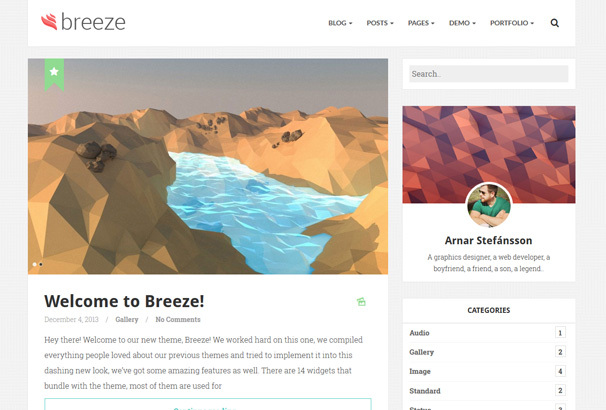 With multiple blog styles and image tagging, Breeze comes with everything you need for your blogging adventure. It’s highly recommended for those who respect page load speed, great looking front-end, and stellar customer support. 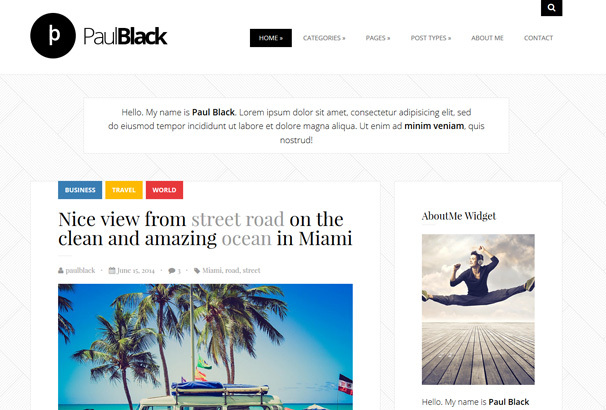 PaulBlack is another personal blog theme. It’s fully responsive and mobile & tablet friendly. Great one to have if you want a simple and straightforward website. It comes with different headers and layouts, multiple colors and post types, as well as different category settings and page titles settings. The main reason why people choose this theme is good looking clean & functional design and swift and efficient customer support. 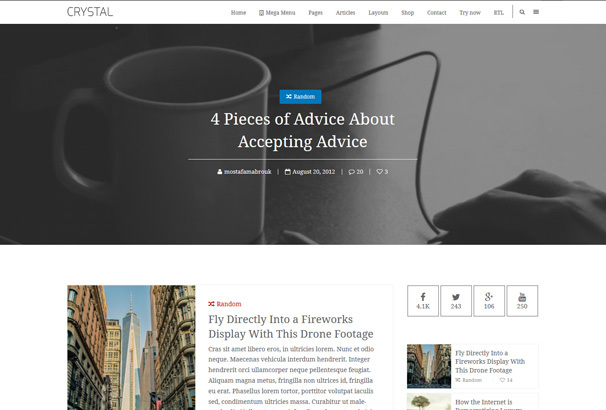 Crystal is elegant and professional blog & magazine theme. It’s ideal for a personal blog, with latest features in the elegant design. If a design is your main goal then this theme will surely do its job. With one-click install, you can start your website almost immediately. It’s fast, it’s SEO optimized and fully responsive with multiple browser support. With drag & drop builder you can arrange your content however you want. Also, it comes with unlimited sidebars and colors. From support team, you can expect detailed online documentation with screenshots and video materials. If you aim at elegant reading experience Crystal theme is a perfect match for you. 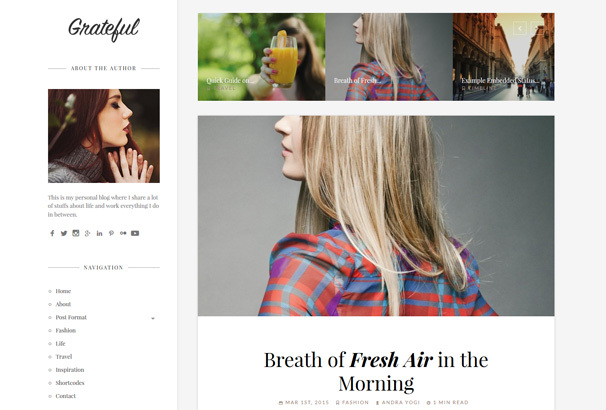 Grateful is modern looking, sleek, two-column fashion blog theme. With versatile features and reduced clutter it will take your content to the next level. Theme is responsive from top to bottom so your readers can enjoy your content on various desktop and mobile devices. Grateful comes with powerful theme options, unlimited colors, support WordPress post format, custom widgets, contact form and it is powered by Redux Framework. 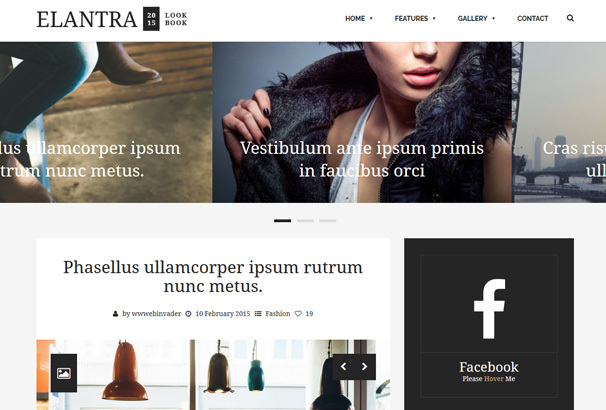 Inkas is a personal vCard and blogging theme with a cool, clean and modern design. It’s built on Bootstrap 3.x framework and Redux Framework which guarantees you optimal page loading speed. It also comes with 7 blog loops, 2 page layouts, 8 post layouts and 5 amazing sliders. If you are one of those people who love the modern and clean design with right typography structure then Inkas is the right theme for you. If you are a creative person then Posts is the worth your time. It’s brand new theme with Drag & Drop page builder. Besides that, it comes with many cool features like sliders, flexible layout blocks, and unlimited color schemes. It supports more than 50 advanced shortcodes and is brilliant for blog, photography, simple magazine or classic business websites. If you are into flat design then you must give Logger a try. 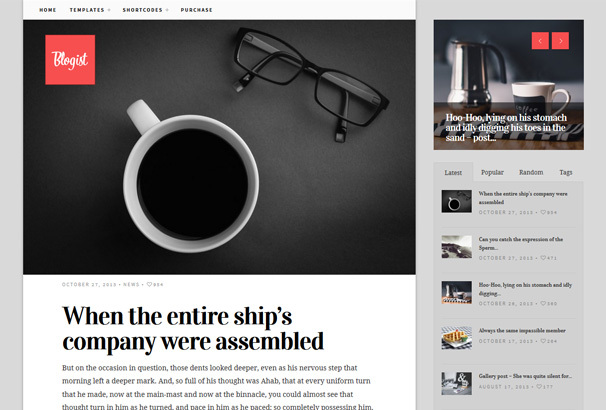 It’s a creative theme perfect for those who are looking for a high-quality magazine template or personal blog. Logger is a highly customizable theme and can quickly change to the multipurpose theme. It’s offering free updates, fully responsive & retina ready, and comes with full woocommerce integration. Also, it comes with advanced admin panel and features like the sticky post, social share in each post, many post formats such as video, audio, SoundCloud, and much more. 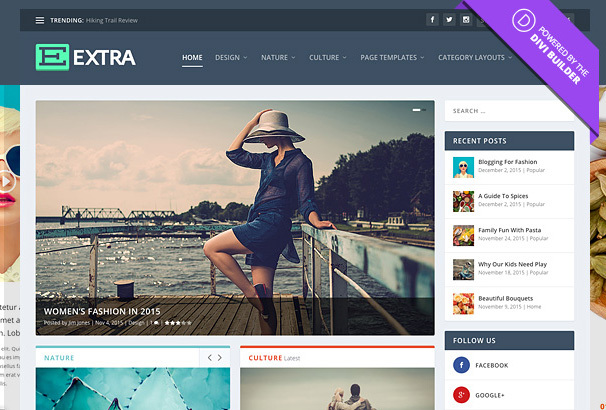 Sastro is a personal blog type WordPress theme suited for any personal or corporate blog. It comes packed with 4 blog types, more than 500 Google Fonts, responsive layout, auto image resizer and Multi-level dropdown. If you are looking for a smooth and clean theme, this can be the right pick for you. If you are a marketer than Ultimate Conversion theme is a logical choice. It’s a digital marketing magazine blog theme aimed at social media and strong community management. Also, it’s designed to showcase your services to a broad audience. The design is pretty cool with bold & sharp typography and pastel theme. It’s powered by easy to use WP customizer, have special slider management and drag & drop ordering. 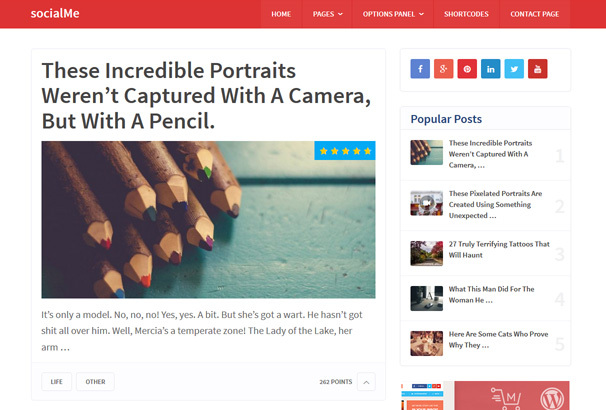 It can be your next theme with 4 blog layouts and customizable featured post areas. Ultimate Conversion is modern looking theme with plenty of features to try. Recommended for those who look for something extra. JabberJaw is a social news theme. It’s easy to customize and adjust to your liking. It includes Visual Composer page builder as well as Easy social share buttons for free. JabberJaw comes with one click demo install so you can get your website up and running within minutes. Also, it includes responsive layout, unlimited colors, font adjusting, mega menus, sticky header and much more. This theme is SEO optimized and works with all of the top SEO plugins. If you are a designer, it includes Photoshop files so you can further customize the layout and look of the site. 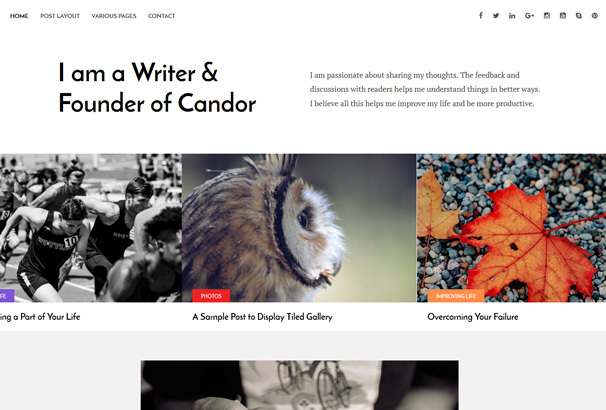 Candor is a nice and clean looking theme designed for writers and entrepreneurs. If you are the person who values bloat-free design then Candor is your number one choice. It comes with 4 different design variations for the blog page, mobile friendly layout, and ease of use. It’s worth to mention that Candor is developed with SEO in mind so your website is optimized for rankings straight out of the box. Good use of semantic tags ensures that your site is properly internally linked.